This Belleek ring dish features hand painted green shamrocks and will guard your rings when they are not being used. The Irish Belleek China ring holder dish stands 2 1/4” tall x 4 1/2" wide and is enhanced with hand painted green shamrocks. 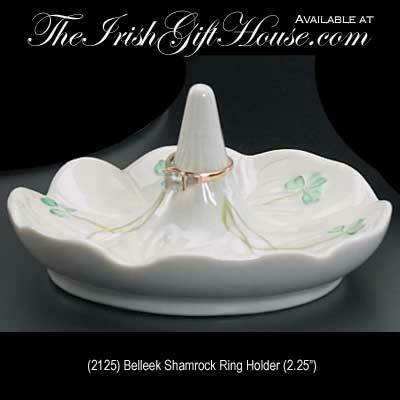 The Belleek ring minder is gift boxed with the shamrock history and is handmade in Belleek, Ireland.